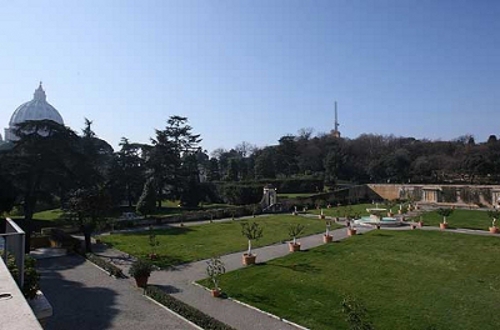 The Vatican Gardens are a private garden complex within Vatican City. They cover 57 acres and comprise the majority of the Vatican State, as you can see from the map. It is possible to take tours of the Vatican Gardens, but only through the Vatican themselves. The tour operates everyday except Wednesday and Sunday and costs approximately €30 per person. Booking can be done online, through their website www.vaticanstate.va and full details are available from them. I recommend trying to book a gardens tour quite some time before your arrival in Rome, at least a month if not earlier. On tours such as mine, or that of any other guide or company, you can get a good view of the gardens, take photos of them but unfortunately not enter them. You can only enter the gardens on an official Vatican tour. The Vatican Gardens date back to the 13th Century when Pope Nicholas III developed the land within the Vatican Walls. He planted an orchard, created a lawn and flower gardens. From there successive Popes developed and expanded upon the gardens turning them in to the beautiful, tranquil area they are now. While you are in the gardens you almost forget you are in the middle of one the busiest cities in the world and surrounded by the most visited museum complex in Europe. The Gardens are used officially by the Pope for constitutional walks, usually after dinner, when tourists have gone home. Like with the rest of the city, his Holiness is kind enough to allow members of the public see this inner part of the city. They provide the serenity necessary to approach matters with a clear mind and much church business is discussed by the Pope with his attendants. One of the favourite locations of the previous Pope Benedict XVI is the grotto; a recreation of the grotto of Lourdes where the Virgin Mary is believed to have appeared. He often uses this site for prayer and private reflection. Dara was very helpful and informative. He knew each room and detail and I am glad that he was our tour guide. He had a nice personality and I was amazed with his ability to keep counting our group to make sure all were together before we moved forward. I have already recommended your tour to other people as I traveled in other parts of Italy. Dara did a great job and was very informative regarding the amount of art and sculpture that was covered. His explanation was in story form and he connected what was happening during that time in a very easy to follow description. Dara was great. We had to leave the tour early because our ship changed the departure time from the port city – move it up 1 hour. Dara gave us great directions on where to go to see what we wanted to see since we couldn’t stay with the tour. He also was very informative while the hour or so we were with the tour. Dara was excellent I throughly enjoyed the tour as did my family. I would do it again when I return. Just loved all the info that Dara gave us. Excellent tour and tour guide. Would recommend your tours to our friends visiting Rome. Thanks for your services. While Dara was amusing and spoke clearly, your microphone system managed to cut out a good third of the information which he spoke into it. Several guests inquired about the quality of the broadcast. This was to be sketchily made out through the transmission, while more interesting things were not. The performance of Dara was good, however the time frame allotted and the shear load of visitors to the museum and vatican allowed for nothing in the way of an undisturbed visit. I was incredibly impressed with Dara’s knowledge and the tour given. I have even purchased a book about the art of the Sistine Chapel in order to develop my knowledge!! Very impressed and would highly recommend. General Tour Worth every penny.